Conversations with a couple of top executives recently revealed that they’re being drawn into solving something usually seen as an HR problem: career pathing. CEOs count on HR to answer three basic questions for employees and prospective new hires about working at their company: What’s the job? What’s the compensation? What’s the career path? These days the party line from HR to ‘what’s my career?’ is failing to satisfy a range of employees, and CEOs are hearing about it. Why? First, let’s look at why this is generally a hard question to answer, then we’ll be more specific about today’s answers. The war for talent is especially fierce in the current robust economy, and CEOs better be sure their company’s employee value proposition – job responsibilities, rewards & recognition, career path, colleagues, and culture – beats the competition, or they won’t hire and hold the talent they need to prosper. What’s the challenge here? The first of these – job responsibilities – is usually handled by the hiring manager; she knows what she needs done. The second is usually handled by HR; there’s a lot of science to it and a broad landscape of best practices. The last two are, to a large degree, outcomes of the others: you get who your value proposition appeals to, and colleagues carry culture. The thing in the middle – career path – is employee-specific and squishy. At any moment, an employee knows what he is – Market Analyst – but career path answers a more fundamental question: ‘what am I going to be?’ Brand strategist? Director, Market Analysis? VP Marketing? Major Account Rep? Business unit general manager? CEO? It’s the province of every employee’s hopes and dreams. There’s only so much room at the top and so the possibilities decline in number the longer you’re there, which adds to the challenge in answering the career path question. Secondly, why is the question of career path harder these days? What’s changed? Three distinct trends are combining forces to push this topic onto the CEO agenda: flat organizations, Millennial expectations and topped-out talent. Flat organizations have come in for a lot of criticism and adopting such a model whole cloth has been largely discredited. [Find an excellent summary here.] However, the net takeaway is greater use of horizontal management concepts like projects, teams and process management, and fewer of the functional and geographic management roles traditionally targeted by career plans. In addition, the fundamental precepts of the various flat organization models – autonomy, speed and innovation– thrive as universal goals in today’s organizations. And it appears that these net takeaways from the flat organization movement have lodged along the career path like a breakaway bee swarm. Even if you’ve got a strict hierarchical organization, employees of all ages and stages these days expect it to provide more autonomy for them, speedy decision making and opportunities to contribute creatively. The pressure on ‘what’s my career path?’ is increasing while the answers are getting more complicated. Millennials come by such expectations honestly – it’s been bred in them from birth by their Baby Boomer parents to expect recognition for their uniqueness. This is the generation of parents known for encouraging self-expression, de-emphasizing competition so no one has hurt feelings, and finding ways to give everyone a trophy for something. [Find a quick synopsis here.] The impact in an organizational setting is a systemic career impatience, which has added to the pressure on HR departments as Millennials’ numbers in the workforce have increased. Decisions about organization design and top talent have always been the CEO’s province, of course, but these trends are increasing the number and nature of the decisions, which has brought them into some of my client conversations. The schoolboy’s notion of Napoleon is a little man in a funny-looking sideways hat posing pompously for his portrait, a hand tucked mysteriously inside his waistcoat. He tried to conquer the world but was forced into a disastrous retreat from Moscow, lost a famous final battle to the English General Wellington at Waterloo, and was exiled until his death on an island in the middle of nowhere. Lost behind these simplistic notions are his leadership in the democratic revolution that overturned monarchic rule in much of Europe, his enduring contributions to law with the Napoleonic Code, and his genius for battle. It is this last quality that inspired the classic 19thCentury theoretical treatise by Carl von Clausewitz On War,to which all subsequent academic literature about warfare is indebted, and an intriguing 2002 book by Columbia Business School professor William Duggan from which I take my title, Napoleon’s Glance: the secret of strategy. 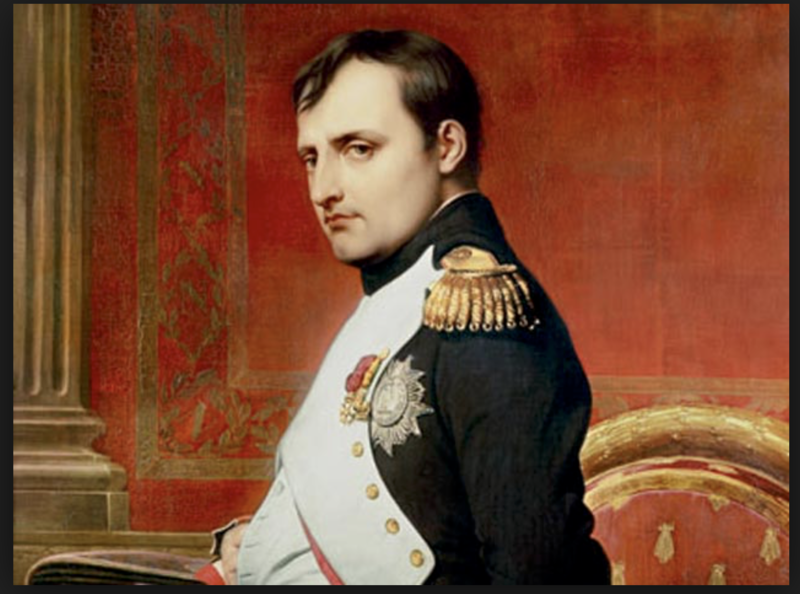 Napoleon’s success as a general was rapid; he was given his first command at 26 and ruled all of Europe by 35. His innovative approach to battle matched the revolutionary fervor of his politics, and he made France widely feared for both. Opposing generals of his day were regularly mystified by his troop movements, drawn into battle in unexpected places, and flummoxed by his unorthodox tactics in combat. Von Clausewitz was a staff officer in the Prussian army beaten by Napoleon. He retreated to the academy and put Napoleon under study to write the definitive text on war. Unfortunately, he died before finishing, leaving his brilliant but rambling written work to be published posthumously by his widow. Duggan has pored over the 600-page unfinished work and extracted its pearls of wisdom about Napoleon’s approach, thereby doing both strategy and Napoleon’s reputation a service. It all comes together in the story of the taking of Toulon. The French Revolution is underway and 24-year-old Napoleon Bonaparte, a military academy graduate captaining a battalion of light mobile artillery in the French rebel army, is newly assigned to the command of General Carteaux who is charged with taking the southern France port of Toulon back from the British-led crown forces. The veteran Carteaux asks Napoleon to assess the situation and suggest a plan. He then ignores Napoleon’s advice—scoffs in fact—and launches a frontal assault on the embedded royalist troops. He is defeated and subsequently relieved of command. The replacement general is intrigued by Napoleon’s plan and puts it into play. In relatively short order, the British are beaten and capitulate. A three-month siege is concluded in just over three weeks. What did Napoleon see that no one else did? Napoleon’s taking of Toulon was the gift of a coup d’oeil, literally a stroke of the eye, a glance, by which he seized in the instant upon a winning plan of attack. Instead of taking Toulon in a frontal assault ‘by sword and bayonet,’ Napoleon sees a pattern in the terrain of battle that resembles other battles from history. If he can take a small hill fort guarding the English western flank called l’Aiguillette, he will command with his cannon the entrance to…and exit from…the harbor. With a similar tactic, the American Colonial Army forced the British to abandon Boston by bringing cannon to the Dorchester Heights overlooking the harbor in range of the British ships’ exit. The same examples from military history and the same tools of war were available to any general officer on the scene. What did Napoleon possess that let him know this battle example and these artillery tools were the most immediate path to victory, and gave him the gumption as a 24-year-old captain to insist on his rightness to a commander almost twice his age? Presence of mind. Readiness for anything, detachment from any specific outcome, the ability to expect the unexpected. In this case, to see as equally likely a) confirm the General’s plan, b) suggest something better, or c) assess the situation impossible. It is these elements of Napoleon’s glance that have such direct application in these times of increased pressure on career pathing. Applying them to careers has the virtue of empirical success, and more importantly, it shifts the balance of responsibility for career toward the employee. Here’s how you as CEO could adapt these four elements into the advice you give emerging leaders in your company about their careers. Coup d’oeil. Nourish your knowledge; expand your skills and experiences. Constantly consider the choices at the intersection of opportunity, work, and impact in light of other examples. Find your path. Determination. Know that courage is valued above tact by leaders. Know that when you know, you know. As one of the works I see amongst ‘the new classics’of the leadership literature indicates, companies don’t develop leaders, CEOs do. Consider making these four elements a centerpiece of your ‘teachable point of view’ about what it means to be a leader in your company. I am indebted for this formulation to William Duggan’s highly recommended synthesis of On Warin Napoleon’s Glance. Duggan has built on his analysis of von Clausewitz and Napoleon to develop a broader theory of strategy in two recommended successor works used in his teaching: Strategic Intuition: the creative spark in human achievement, and The Art of What Works: how success really happens.